My friend, Ilys, came over the other day and we played around with a big box of crayons - the one with 64 different colours and even a sharpener - the box of Crayolas I lusted after as a kid! Using the window as a substitute for a light table, we used a pencil to trace out our designs onto tea towel fabric. Then the fun began! Start by finding your canvas. I used a 100% cotton tea towel with a smooth surface and washed it to remove the sizing. I ironed it and then ironed a piece of freezer paper to the back to give it some stability for colouring on and to keep the surface smooth. 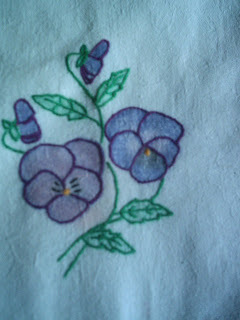 I chose a pansy pattern and had a lot of fun colouring and shading. It was an experiment in techniques so I ended up with one pansy I like more than the other. We found out that if the shading is too subtle it gets lost in the end. Not many rules - mainly the ones you remember from being a kid: try to stay in the lines and go all in the same direction. It is better to go over it again lightly several times than to try to do it darkly in the beginning. When your design is completed, remove the freezer paper and iron the fabric, putting a plain piece of paper above and below the design and using a fairly high setting. 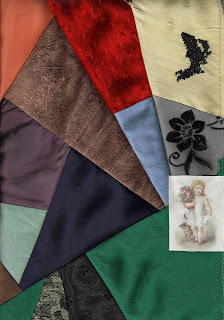 The paper absorbs most of the wax and you are left with your coloured design. It will look exactly the same - the stroke marks show. etc. After that it was just a matter of using 2 strands of DMC to stem stitch the outline. Then I washed it to take out the pencil marks. I was pleased to see that washing doesn't affect the intensity of the colour of the crayon design. This is just a fun relaxing technique and I can see it lending itself to several different applications besides tea towels. For a start I have a couple of packages of quilt blocks preprinted for embroidery, one set of roses and one of butterflies. I had completely lost interest in doing them as they were intended but I imagine they may be the next place I play with my Crayolas. So, get out the crayons and have fun! I had a lot of fun today working on the teacup block. The first thing I addecd was a stickpin I picked up at the thrift store with this block in mind. After removing the pin portion I was left with a little metal teapot and cup joined with a dangling chain. I love it! It got sewn on with a pale silk thread. In keeping with the theme, I added a teabag! I used a real teabag for a pattern. After disassembling it and reducing the size by 50%, I used a portion of very fine fabric from a damaged vintage ladies hankerchief to construct the bag. The embroidery on the hankie as well as it's pretty scalloped edge will find their way into another project in the future. To fill the teabag with tea, I used small silverlined green seed beads. The tag on the tea bag is embroidered in long and short stitch and the string is stem stitch, both with one strand of DMC. The bag was a hoot to build - great fun - and I am happy with the result. It ended up very close to what I was visualizing. 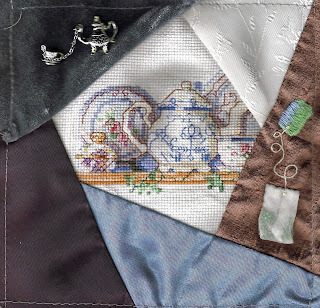 This is a second little teacup crazy quilt block I have put together for my local guild. Again, my love for cross stitch shows through since that is what the center motif is. I should make it clear though that this was not done with waste canvas! This is the second half of a little cross stitch picture I came across at the thrift store. I love to save those little treasures! I hate to see all the work someone has done sitting in a thrift store abandoned. So, hopefully, this is a way of giving it new life. 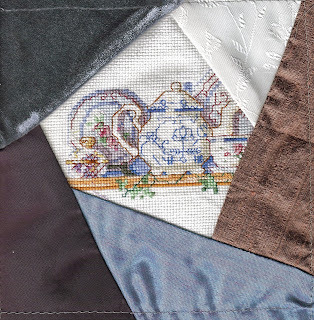 I simply treated the cross stitch as another piece of fabric in the construction of the six inch crazy quilt block, giving it a starring role in the center. I'll do the seam treatments now and some motifs in the other patches and it will go to the guild to be included in one of the little wall hangings we make for members who are moving away so that they have a gift to remember us by. Teacups are the theme for these hangings and this is why I chose this cross stitch. This is the block I have made for the CQI Novice Group Anything Goes Round Robin I will be in with Rebecca, Rosa, Rita and Sharon. I'm really looking forward to this round robin! I had some fun making the block too. In the upper right hand corner I used a piece of dupioni silk that I had previously cross stitched a silhouette onto using waste canvas. This is one of my favourite techniques (waste canvas). I made a page of silkies today when I needed one for this block. This one came from the weekly freebie image you get if you subscribe to the newsletter at The Vintage Workshop. It is a pretty sweet little picture with the little girl and kitties. I'm a recent subscriber to their newsletter so this is the first image I have had to play with. I'm already looking forward to the next one! If they are all as nice as this one I will be buying at least one of their CDs in the near future. So, I'm looking forward to getting a block in the mail to start stitching on soon in this round robin. On the Crazy Quilting International list, we have been discussing painted mother of pearl buttons a lot with the help of a great tutorial from Gerry. I am going to try it but I thought I would try some covered buttons first since I think I do a lot better in painting with a needle rather than brush! 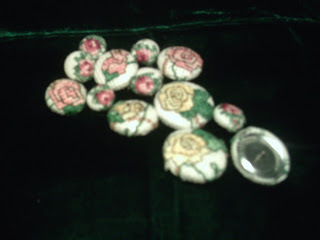 I took some small cross stitch roses and used several sized of covered button kits to give it a try. Although I always thought the construction of covered buttons was a bit intimidating I was pleasantly surprised with how easily they went together. These particular buttons range in size between 3/8" and 3/4" and I think I like the smaller ones better. I think they will be fun to add to button clusters on crazy quilted blocks or perhaps to attach them surrounded by beads cabachon style. It was a quick and easy little project! This book was recommended by Maire at CQI and I ordered a copy. I am so happy I did! Thank you, Maire! I will add my recommendation to hers! Last night I finally got a chance to sit down and try a couple of the stitches. 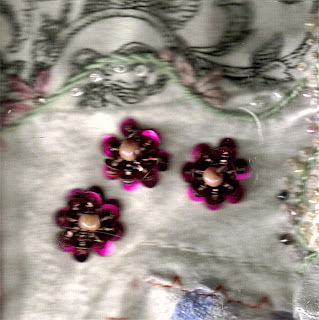 The top picture is the Sequin Flower Stitch from Page 38 of the book. These little three dimensional flowers are so easy to do following the step by step pictures and instructions in the book! I love them! I can just see them done as cherry blossoms on a branch motif. 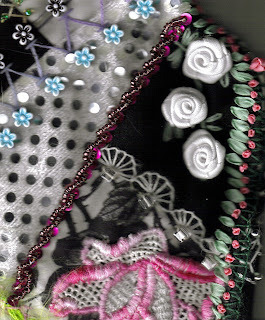 The second stitch I tried was one of the beaded edgings on page 34. It turned out perfectly for what I wanted, making a pretty braided effect. It's funny that both of these stitches involved sequins as well as beads because I have never found much use for sequins. I can see that changing now though! This would have been a loopy stitch if I had used more beads on each stitch but I'm happy with it the way it is. The book is small, only 40 pages, but in my humble opinion well worth the price asked. It is available on Amazon - that's where I got it - and the list price is only $12.95. I can't wait to try a few more of the stitches tonight! These examples were worked on Dee's Ms. Bamboo, a teddy bear for her darling daughter. The theme for February it what are you old enough to remember? I remember milk being delivered to the door in glass bottles with little cardboard tops that were the forerunner to pogs. I remember that since the milk was not homogenized on cold winter days the cream would rise to the top and freeze creating an inch or two of "ice cream" which my brothers and I could compete for. I remember when a bottle of Coca-Cola cost 12 cents and there was a 2 cent deposit on the bottle. (Incidentally, I remember when typewriters had the cent sign on them which computer keyboards no longer have.) I remember when the coke machine was like a large metal ice chest full of cold water and you would take the bottle you wanted by the neck and pull it through a maze like path until you could pull it out the opening. I remember when bottle openers were on the machines and the caps fell into a holder below. I remember when store screen doors had wide push handles across them emblazoned with the logo of your favourite soft drink. I remember when popsicles were only six cents and if you only had three cents the store person would break it in half and sell you one side of it. I remember when penny candy was everywhere and a dime would buy you a bag of candy big enough to make you sick. I remember jaw breakers, licorice babies, black balls, etc. I remember Gwenny's candy shop where she sold barley sugar she made using molds of ships, bunnies, etc. I remember Christmas parcels coming from my auntie in England and all the nooks and crannies of the package weren't filled with styrofoam - they were packed with exotic candy bars we had never heard of here and dolly mix and jelly babies and Blackpool rock. There were always pregummed strips of paper ready to be licked and joined into miles of paper chains for Christmas decorations. I remember when the Beatles played on Ed Sullivan. I remember when I was allowed to stay up on Sunday night to watch Ed Sullivan until Topo Gego came on. I remember The Rifleman, Have Gun Will Travel, Bonanza, Wagon Train, The Lone Ranger, Rawhide and Maverick. I remember all the words to the theme songs. I remember watching in black and white when the Queen visited Canada, when John Kennedy was shot, when they walked on the moon. I remember being free to run and play until the street lights came on and signaled time to go home. I remember crowds of kids playing hide and seek, kick the can, freeze tag and cowboys and indians. I remember when an abandoned car was a source of endless games and delights. I remember my mother curling my hair with a curling iron she heated in the wood stove. I remember when all baking was homemade and all the laundry was dried on a line and then ironed. I remember matching dresses my sister and I wore to England to visit my grandparents made from a border print my auntie bought at the market and sent to my mom. I can look at one of the quilts my mom made and pick out that 101 Dalmation fabric as well as the blue and red starred cotton my pedal pushers were made from. I can remember housedresses and aprons. I can remember my parents when they were a lot younger than I am now and I still think they were wiser than I am now. I can remember starting to learn embroidery and stitching placemats, pillowcases, tea towels, dresser scarves and anything else that wasn't tied down. I can remember making yards and yards of corking with wool and a spool with four nails in it. I can remember when a store bought dress was my wildest dream. I can remember wearing miniskirts, maxiskirts, bell bottoms, suede fringe, blue mascara and eyeshadow, white lipstick, an army jacket and a horrible old racoon coat my mother was convinced had fleas. I remember the best dog I ever had, my best friends, and special teachers who sparked a love of learning. I remember the strap, holding books over my head and standing in the corner. I remember bad things that have changed for the better and good things that have changed for the worst. I am very happy to have married a man who also remembers the things I do and who can sing the theme to Maverick with me. I can't remember an appointment I have to keep, what I ate yesterday or where I put my glasses and car keys.